After graduating from vives.be school in 1996 with a fresh microprocessor engineering degree, I joined a new startup called Planet Internet. It was one of the first companies in Belgium offering internet access to consumers. As the company’s first network administrator I started a blog talking about my big passion : video games. A couple years later this tiny little blog grew into www.spelletjesgarnaal.be, the largest dutch speaking online gaming community in the world with over 30 million visits each month. From hosting the very first multiplayer servers in the country to becoming the official Benelux qualifier for the World Cyber Games, this award winning online community became the number one stop for every gaming lover in the country. It was a crazy fun ride but in 2011, after running online communities for almost 15 years, I decided to make a change. I wanted to get more involved in the creative side of the gaming industry and started working on my own iPhone game. After assembling a small team of freelance developers we created a prototype of a fast paced tap-to-shoot mobile arcade game and quickly found a publisher willing to purchase the rights. Soon after that I was hired as Product Lead for UK’s leading mobile game studio: Natural Motion. My first project was to take the existing licensed mobile game NFL Rivals and turn it from a premium game to a free-to-play in-app purchase game. After designing and implementing the collectible card system into the game, revenues grew by 35%. My next project at the studio was a special one: Clumsy Ninja was an exercise to take the company’s proprietary technology (Euphoria) and create a fun mobile game with it. The result of this design exercise is Clumsy Ninja, which had over 10 million downloads in the first week on the app store. Sometimes in life, you get an offer you simply can’t refuse, which is exactly what happened to me in 2012 when PokerStars was started their mobile division. As product manager new platforms I was responsible for the user experience design of the PokerStars mobile app: the first mobile app that allowed users to play online poker for real money on the go. It was a crazy ambitious project but the results were staggering: when I left PokerStars the mobile app accounted for 30% of total revenue. I left PokerStars after meeting the founder of Oculus, Palmer Lucky, in 2013. He showed me a strange duct-taped device he was working on. When I put it on, I was blown away. Suddenly I found myself standing inside DOOM, a game I spent many hours playing on a computer screen. Seeing a demon lunge at me in VR gave me such a visceral reaction, I immediately realized that this technology was going to be a game changer. Shortly after that I moved to Irvine, California to be close to Oculus Headquarters where I spent the following years tinkering with this amazing new technology, trying out hundreds of ideas. The goal for me was to fully understand what makes this platform different. What can we do with this tech that can not be done without it? While everyone around me was copy-pasting ideas from the gaming world into VR I was experimenting with where the magic of VR lies: presence. Presence is when your virtual world is so immersive, it crosses a certain threshold allowing you to accept the virtual world as real. With early (and even current) hardware it is hard to achieve presence (and even harder to maintain it) but when you do, you really understand why VR/AR is the future of computing. In 2015 I founded Immersive Entertainment and we started development of our first presence inducing experiment called The Grand Canyon VR Experience. It was released in 2016 as a launch title for the HTC Vive and the Oculus Rift and gathered generally favorable reviews with the biggest criticism being “too short”. After that we started working on a much bigger project, a vision of a truly organic AI driven extremely immersive and interactive world, called VU (Virtual Universe). After years of development and solving many of the hard problems the industry was struggling with such as nausea, locomotion, interactions we finished our prototype in 2018 and invited a handful of social influencers to try it out. 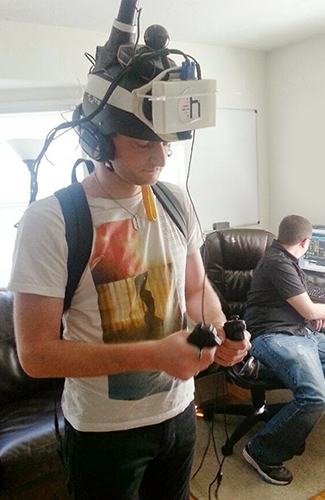 The response was phenomenal with reactions such as “best VR world I have ever experienced’. I am currently available to work on new projects. If you need a well seasoned freelance designer for your VR project, contact me!